But the casting vote really went to Lana. Too scratchy when hugging. So off it went! The night Ariel blew up! One Friday evening in mid January Ariel said she had a headache. In Australia we would normally have used Panadol (Paracetemol). Here the choice is Tylenol or Ibuprofen. We had some Ibuprofen so she was given some of that and went to bed. Next morning Ariel awoke and said her face felt “a bit puffy” Without looking up, David said she should go back to bed and sleep in. Lana had a look and suggested David look closer. Ariel’s face was very swollen – she could hardly see out of her eyes and the every part of the face was big. He was up in a flash and told Ariel to get dressed. They were going to the doctor’s. There is a doctor’s surgery in Blairsville that provides for “Drop ins” – that is, no appointments. They went to the reception and without looking up, the receptionist asked what we required, and David pointed to Ariel and said, “Guess.” This certainly got a reaction at the sight of Ariel’s swollen face, and she quickly checked if Ariel was having difficulty breathing. If she had been it would have been off to the hospital. After a wait of about one and a half hours they finally got to a consultation room. An assistant came in and asked lots of questions, carefully recording the answers on a chart, went out and returned and gave Ariel some medicine to help with the swelling. After 20 minutes, the doctor appeared, read the same chart which had all the answers and asked the same questions the assistant had asked. Finally Ariel was given an injection with some medicine to reduce the swelling and they were told to wait another hour in the waiting room to ensure all was well. Once the hour was up, they were told they could go. Ariel’s face was still slightly puffy Sunday Morning and was back to normal by Monday. Ibuprofen is part of the drug group known as NSAIDS. We then did some research and worked out all the brand and generic names that belong to that group – including aspirin – and ensure that every time we go for any medicine or medical procedures we mention the risk of Ibuprofen. Total cost? $140.00. Lucky we had insurance! We have no photos to show you. Ariel would never have forgiven us the embarrassment – and we can’t blame her for that. Here is a recent family photo from Christmas 2004. 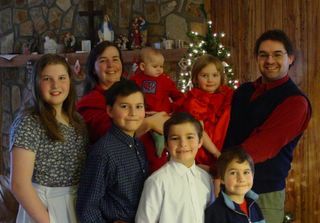 From left to right - Ariel, Lana, Eric, Rose, James, Clare, Peter and David. In New York the city celebrates the new year with the famous apple drop. In Atlanta they have the Peach drop. In Brasstown, North Carolina, they have the Possum Drop. 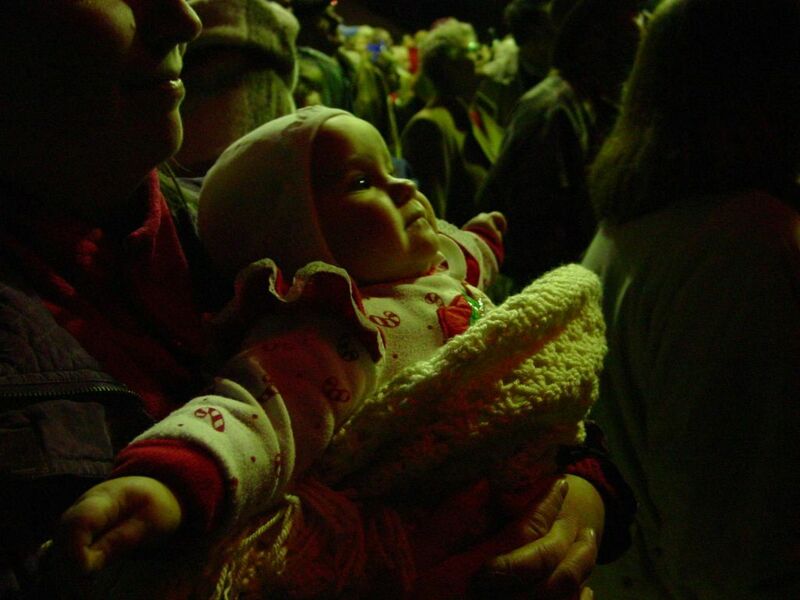 This year we attended the annual Possum Drop to get a true experience of Southern hospitality. 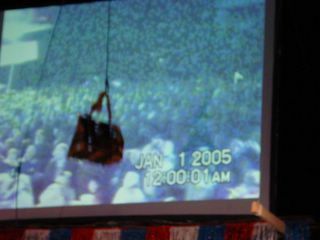 Arriving there at about 10:00pm with the Morris family, there was already quite a crowd gathered around the stage set up beside the gas station that has hosted the Possum Drop for the last sixteen years. The host for the evening warmed up the well-dressed crowd (lots of warm clothing and silly hats) with some good tales and commentary. Did you know that if you get lost in the woods, just find a possum trail and follow it straight to the road? The organiser said that they had a lot of hassle from the animal rights people. He reckoned that it is easier to adopt a child than get permission to drop a possum. Four licenses were required and the fees were under $1,000 – WELL under $1000. The gas station was tastefully decorated in the possum theme, complete with outlines of run over possums on the ground. The hill opposite had a Hollywood style sign stating “BRASSTOWN” with a large possum sign above. A very fancy limousine stopped at the kerb and a way was made through the crowd. Dignitaries then opened the car door and brought out this year’s host possum. US possums (actually called Opossums) are NOTHING like Australian possums. They look more like an overgrown rat than a cute toy. If anyone has seen the film “The Princess Bride”, the Opossum reminds us of the ROUS (Rodents Of Unusual Size). The possum is then carried on the shoulders of one of the assistants and placed in a specially constructed cage. Unfortunately the cage wasn’t strong enough, so they carefully rebuilt it with appropriate amounts of Duct Tape. (The all purpose repair tape – similar to The Force in Star Wars – It has a light side and a dark side and it holds the universe together). The cage is then fastened to a rope and pulled up to a prepared metal frame so it hangs around about 20 feet in the air. We were then shown a video of the epic feats to which the organizing group went through to capture the possum, a “beauty” contest in which various local celebrities (men) dressed up as fashion queens, “Redneck” music and jokes until it finally came time for the year’s end. The Possum dropping in Brasstown, North Carolina. Some patriotic songs and the National anthem were sung, and it was time! The cage containing the possum was dropped (not too fast so the possum wasn’t hurt) and the fireworks went off. At about 12:10 everyone looked at each other, wished “Happy New Year” all round and went home. Why go to New York, when you can experience this!